Enjoy a day of fun at Marineland Majorca and Western Park Majorca! Once in resort, please call the number supplied on your voucher to confirm your hotel pick-up time. What: Marine zoo and water park. Don’t Miss: Coming nose to nose with dolphins in Marineland and chilling out in the vast Jacuzzi at Western Park! Visit two of Majorca’s most exciting attractions in one on this action-packed day to Marineland Majorca & Western Park! Visit two of the Majorca’s best loved family-fun day out destinations – Marineland Majorca marine zoo and Western Park water park! See weird, wild and always wonderful marine creatures from around the world at Marineland Majorca. Watch Marineland’s multi-award-winning animal shows featuring dolphins, sea-lions and parrots. 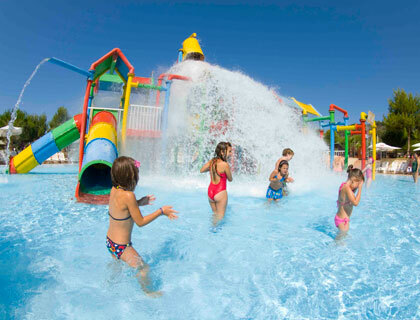 Make a splash on breathtaking water rides, slides, attractions and more at Western Park Majorca! Includes hotel pick-up from various resorts around the island. If you are visiting Majorca, don’t miss this exciting full-day excursion to two of the most popular and exciting destinations on the island – Marineland Majorca - home to award-winning dolphin shows and all manner of fabulous marine creatures and Western Park water park – with fantastic rides, slides and water attractions for kids of 0-99! Along with weird, wonderful and always amazing marine creatures from around the world, Marineland Majorca features multi-award-winning shows starring sea-lions, parrots and dolphins! Visit aviaries featuring beautiful exotic birds from Africa, America and Australasia and watch Californian sea lions showing off their acrobatic skills and playful nature in their own spectacular show. Visit Marineland Majorca’s tropical aquarium – home to beautiful weird, wild and always wonderful marine life of all colours, shapes and sizes. Admire the inhabitants of the tropical house, including all manner of slithery snakes along with lizards, iguanas, fresh water fish and piranhas. Western Water Park’s breathtaking rides, slides and attractions, high-diving shows, falconry displays and professional saloon shows are set in the three exciting zones of Western Land, El Paso and Indian Town. Your little squirts have plenty of cool things to explore at Western Water Park, where they can test their courage on Hurricane and Tornado, make a splash in the Wild River, beat off the competition in Crazy Racer and more! Water babies are not forgotten either, with hours of splashingly good safe-play fun to be had at Mini Park and Daky Park. If hold-on-to-your-cossie fast and furious rides are your thing, you’re in luck! Head to the 260 metre Mega Slide, the famous Kamikaze or maybe the infamous Big Hole – the longest water slide on the island! Enjoy a snoozy siesta or well-earned rest in Western Park’s leafy and colourful gardens, or, for the ultimate pamperfest, let the bubbles of the Jacuzzi soothe you in both mind and body. Don’t miss Oliver's Water Show in the El Paso zone, where each day 3 brave, acrobatic divers take a leap of faith from a 30m high board into a very tiny pool! And it’s here that you’ll catch the unmissable Sea Lion show which highlights the touching bond which develops between the sea lions and their keepers. With full-time lifeguards, showers, lockers, loads of free parking and superb restaurants, cafes, snack bars, gift shops, ice-cream parlours and more - Western Water Park has everything you need to complete a fun family day out! Tuesdays and Thursdays from May to September. You will be picked up at approx. 8.30am. Please ensure that you are at your hotel lobby or pick-up point at least 15 minutes prior to pick-up. Admission to Marineland Majorca and Western Park Majorca.